A newly classified weed was found in two nature reserves along the Moreleta Spruit. The first plant was spotted at the Faerie Glen Nature Reserve by Louise Kritzinger from Friends of the Faerie Glen Nature Reserve in 2015. It could not be positively identified because the plant was not in flower. During a routine alien vegetation survey at the Moreleta Kloof in 2016, more plants were noted. In 2017 plants in both localities were in full flower and were identified as Chinese hollygrape, Mahonia oiwakensis, sold in nurseries as ornamental plants. 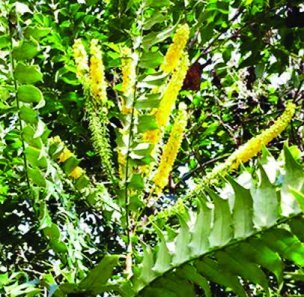 National Biodiversity Institute (SANBI) in Pretoria, Chinese Hollygrape is the first Mahonia species to be detected as naturalised in South Africa. It is a member of the Berberidaceae family and is native to China and Taiwan. Some species in the Berberidaceae family are already naturalised and have the potential to be invasive. That is why it was recommended that these species should be classified as category 1a invasive species under the National Environmental Management: Biodiversity Act. Chinese hollygrape is a shrub or small tree with bright yellow flowers that can be observed from autumn to spring in South Africa. The plant produces a massive number of seeds which pose a potential threat.